Paddy Power Bookmaker Review 2019 - Is Paddy right for you? Paddy Power is Ireland’s largest bookmaker, and one of the most popular in the UK. It’s known for bringing a sense of fun to sports betting, as well as for its frequent betting specials, early pay-outs, novelty markets and award-winning mobile apps. It also has a reputation for marketing mischief, earning publicity through controversial stunts and tongue-in-cheek advertising. Set to merge with hugely successful Betfair, it seems that there's no stopping Paddy Power. Here we review the bookmaker's strengths and weaknesses in detail. Paddy Power is a publicly listed company that employs more people in Ireland than Microsoft or Google. It has a market capitalisation of over €2.8 billion, and its profit before tax in 2014 was a whopping €167 million. Paddy Power is licensed by the Isle of Man Gambling Supervision Commission. 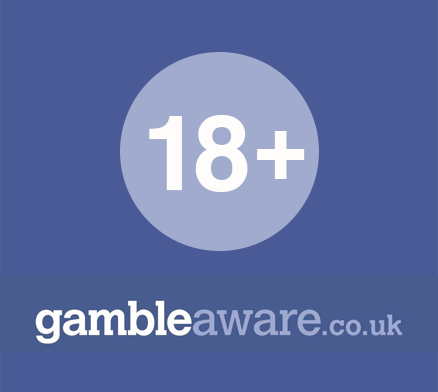 It’s also registered with the Independent Betting Adjudication Service (IBAS), which adjudicates in cases of betting disputes between customers and bookmakers. This gives punters added protection. Paddy Power is known as the most punter-friendly bookmaker, partly due to its “justice pay-outs” (returning bets on matches that have been poorly officiated) and early pay-outs on near-certain winners. On occasion, Paddy Power has paid out early on selections that didn't go on to win – Tiger Woods in the 2009 USPGA Championship being a famous example. However, Paddy Power isn’t faultless. On occasion, it has been accused of failing to pay out winning bets with high odds. Punters have also complained of having their accounts suddenly closed after placing eight or nine of the ten bets required to qualify for a significant bonus. Based on a survey of just over 1,200 punters, Paddy Power’s odds typically provide about 9% better value than the market average. Paddy Power doesn’t head the pack in terms of the best-value odds overall, but its odds are consistently competitive. It also sometimes offers the best odds on the market for a favourite – a move that can't hurt its already huge popularity. Paddy Power is the market leader when it comes to frequent, high-value betting specials. For starters, Paddy Power is offering a Bet £10, Get £30 deal when you sign up. Paddy Power’s best-known promotions are its money-back specials, with offers to refund punters’ stakes under specified circumstances. 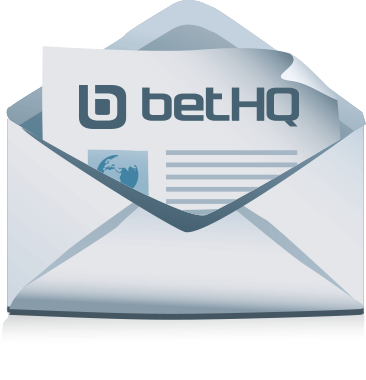 These often substantially reduce the risks of a bet and sometimes offer excellent value. Under the “Don’t be the Fall Guy” special for horse racing, for example, your stake will be refunded if your horse falls. Paddy Power offers some of the best place specials in the business, paying out the most places for golf majors and major horse races like the Grand National. In addition, it offers regular accumulator refund specials on a selection of sports, allowing you to get your stake refunded as a free bet if one leg of an accumulator lets you down. Paddy Power also offers odds multipliers on markets across a range of sports, doubling or trebling your odds on a selection if qualifying criteria are met during the course of an event. Last but not least, Paddy Power offers active clients free betting and bonuses on an on-going basis. These range from free spins to small casino bonuses and deposit bonuses. 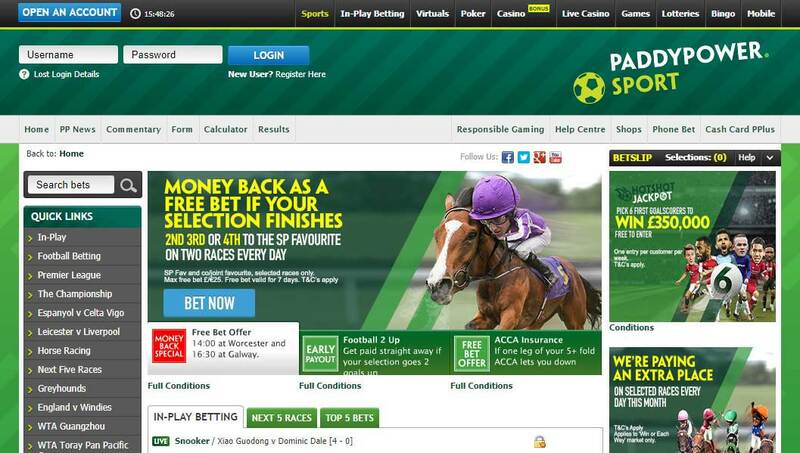 Check our Paddy Powers specials page for details of all Paddy Power's current offers. 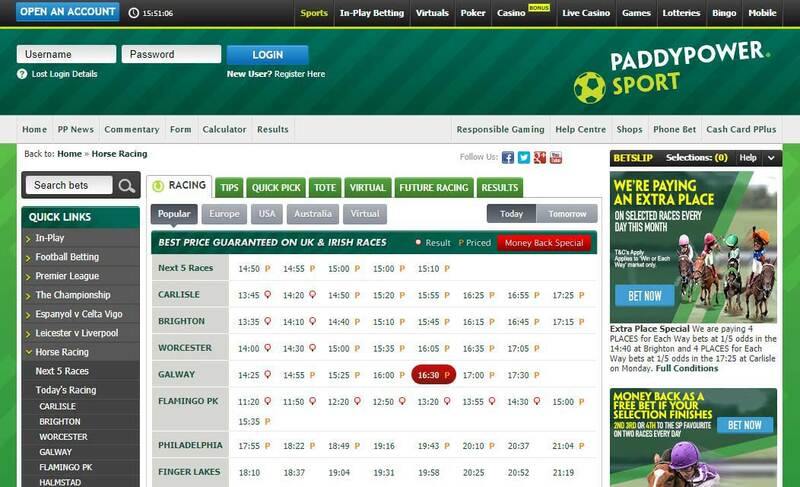 Paddy Power’s website has a clean and easy to use interface with a number of helpful features. For example, you can collapse, expand or rearrange tables to give you control over the display of the many sports markets that are available. Paddy Power’s bet slip works smoothly. Once active, it remains visible if you scroll up or down the page. You can also drag it where you want it or dock it on the sidebar. A quick deposit feature makes it easy (perhaps too easy) to add funds to your account. The account management area has all the usual features and is simple to use. You can easily set your website preferences, which let you choose what information and features to display, access your history or manage funds in your account. Paddy Power provides an excellent set of mobile apps for iPhone, iPad, Android and even Nokia Ovi. The company has won several awards for its mobile products. In 2013, it was the biggest winner at the inaugural mGaming Awards, winning a total of three awards – Best Mobile Sports Betting Operator, Innovation in Mobile and Best Gambling App. If you don’t have a smartphone, note that Paddy Power provides a mobile version of its website at www.paddypower.mobi. Its large selection of mobile games is also very good. Paddy Power provides good customer service that’s similar in quality to that of its bigger rivals, via live chat, e-mail and phone. However, unlike the largest UK-based bookmakers, its customer service isn’t available round the clock; instead lines are open from 8 a.m. to midnight or, on Sundays, 9 a.m. to midnight. Also, customer service is provided only in English. Expect response times of around 20 seconds for calls and up to a few hours for e-mails. Note that Paddy Power handles only two currencies – euros and GBP sterling. All the usual methods are available for payments and withdrawals, including credit cards, PayPal, Skrill and NETELLER. In the UK and Ireland, you can also get a Paddy Power cash card, which you can use to make instant depositsor withdrawals at Paddy Power shops. Unparalleled when it comes to betting specials, Paddy Power is a well-rounded bookmaking service, offering more character and entertainment value than many of the larger, corporate bookmakers.